I was talking to a currency trader for a major insurance company recently, and he was sharing how the rules of currency trading have changed. Nobody seems to know how or why. Actions that would result in a certain response in two or three months now bring a much more dramatic reaction almost instantly. He said that even scarier is the fact that no one seems to know what the new rules are, if there are any. Now we see the same thing happening in politics. Did anyone see Donald Trump doing what he has done? He’s breaking every rule, and the actions we could once count on as having certain definite consequences are doing the opposite. When he did what the pundits said would end his brief candidacy, he actually rose in the polls. The rules have obviously changed, but not many understand this yet, much less know what the new rules are. Donald Trump has broken almost every rule of conventional political wisdom, and he not only soared to the top of the Republican field, but he did so by a wide margin. He continues to do what the professionals think will be his doom, and it only makes him more popular. It is like the political magnetic poles have suddenly reversed. This is a good thing! If you don’t change your direction, you will end up where you are headed, and we were headed for a very bad place. Whether Trump gets the nomination or not, the change has been revealed, and there is great opportunity if we understand it. Fox News is boasting of receiving the highest ratings for any cable news program in history for the recent debate. They deserve a lot of credit for seizing the opportunity to host this debate, but they did not get those historic ratings—Donald Trump did. Had Trump not been on that stage, they would have been hard-pressed to get half of the viewers that they got. The pundits, politicians, and at least one focus group thought that Trump not only had a bad night in the debate, but he was likely mortally wounded as a candidate. Yet in polls taken right after the debate, viewers had Trump winning by margins four or five times higher than any other candidate. How could this be? His answers were not as sharp, and some of the others not only looked sharp, but brilliant. However, there is a huge factor in this election that neither the pundits nor the politicians yet understand—it is the courage factor. It has been so long since Americans have seen real courage in their leadership that if they see it, they are going to follow it above almost anything else. This will be hard for politicians or political scientists to grasp, but true leaders will. It is a sure sign that a new day is dawning. Trump may have been a bit off his game, but he did not do too badly having never been in a debate like that before. However, he won the day because he displayed uncommon courage to stand on his principles regardless of the pressure. Even if you do not share all of Trump’s views or like his demeanor, his courage is giving people more hope than anyone else has in a long time. What could this have to do with Tiger Woods? There is a very important parallel. Tiger Woods changed the game of golf and raised it to a level of popularity and interest around the world that was unprecedented. Donald Trump is very different from Tiger in many ways, but he has the potential to change politics in America in a similar way. For two years, Tiger dominated the sport like possibly no one has ever dominated a sport before. Then he had a cascade of problems, personal and physical, and his game began to slip. A fellow golfer tried to help him with his putting, and the other pros chastised him severely for trying to help Tiger. If all of those other pros had any sense at all, they would have all been trying to help Tiger. Tiger raised the popularity of golf almost single-handedly to the place where he likely doubled every other pro golfer’s income. Not only were the purses for tournaments raised to unimaginable levels, but the endorsements were also some of the richest in sports and every golfer was getting them. From the time that Tiger’s game began to slump, the popularity of golf has slumped on the same trajectory. Courses and golf shops are now closing all over the world. If PGA golfers had any sense they would be helping Tiger with his game as much as they’re working on their own. Now I do understand the competitive nature of golfers and candidates, and that is not going to happen, but if golfers cared more about golf, and politicians cared more about their country than their own selfish interests, it would happen. This morning I was reading about the Republican candidates complaining about how Trump is so dominating the conversation that they cannot get their own messages out. Really? Almost all of the other candidates on the stage of the Republican Debate had brilliant performances that night, and not nearly as many people would have seen their brilliance if Trump had not been on that stage to attract the viewers. Right now Trump is the biggest asset that the Republican Party has. If the Republican establishment is able to demean or remove him from contention quickly like they are trying to do, it could cost them the election. Ted Cruz wisely stated as much, obviously perceiving what an incredible asset Trump is. He would, being one who obviously understands, as he has also shown great courage to stand alone when it's the right thing to do. Trump is not a slick, sophisticated politician. That is a fresh breeze to a country choking in the darkening fog of Political Correctness. In fact, Trump is not a politician at all—he is a leader. He gets things done. Right now Trump gives more hope than anyone else that he will actually do what he says he will do, and he will not be shackled by PC or special interests. Now the people are just waiting for him to say what he wants to do besides securing the borders, though that is without a doubt one of the most critical issues facing us now. The Republican establishment was offended that Trump would not vow to support the Republican candidate for President, regardless of who it was, and that he would not commit to not running an independent campaign. It was the first question of the night, obviously a pitch aimed at Trump’s head, and he showed right away his resolve to stand on his principles without flinching, even if he had to stand alone. It was a stunning display of courage, the kind of which has not been seen in American politics for a very long time. It was a dramatic question and a telltale sign of how the evening would go. It made for great TV. The candidates were not going to get the kind of softball, down the center of the plate pitches, that the Democrats get from the liberal media. That is a good thing. However, this question was far out of bounds. I am a Fox News fan, and Bret Baier is one of my favorites, but my respect for him and the others took a big hit that night. Who does Bret Baier, or any journalist, think they are to try to yoke our candidates with such a vow? Trump reacted to this question the way it was natural for him to react, not with a political answer, but with a courageous one. He stood alone, but he stood. That may be one of the main reasons why so many thought he won the debate that night. More than the party leaders seem to understand this and are just as ready to bolt the Republican Party if it does not change the direction it has been going. Why would anyone back a candidate regardless of who it is? That’s why so many Republicans don’t see much difference between their leaders and the Democrats. There has been far too much party loyalty elevated above what is right for the country. The boldness of Trump not to cave to this manipulation was a fresh breeze of hope and may have won him more respect from the people than he lost with the Republicans for not taking the vow. Besides, didn’t Trump write The Art of the Deal? Any successful negotiator knows that you never give up leverage without getting something for it. It would be great to see those negotiating our foreign affairs understand some of these basics. In possibly every agreement negotiated under Obama and Clinton, America has given far more than we should have, maybe even our future, and received nothing in return. Trump has the leverage of the Republican Party, knowing that if he runs an independent campaign for President, it will likely doom the establishment candidate. What people are not considering is that Trump may torpedo the Republican candidate that way, but he might also win the Presidency that way. Democrats are as fed up with their party as Republicans are. There are more independents now than Republicans or Democrats. It was not surprising to me that Fox News would get so many kudos from the liberal media, and even Hillary Clinton, for their performance that night. It seemed for much of the night as if they were using the liberal media’s playbook, presuming to be judge, jury, and executioner. When you get kudos from the media the way they did, it is because you have fallen to the same kind of lows they have and departed from what a trustworthy, independent media is supposed to be. This does not mean that they should not have asked tough, challenging questions. However, they were so lopsided in the way they did it that the bias was obvious. Even worse, the tone of either arrogance or personal issues in which some of the questions were asked was cringe-worthy. I do consider Fox to be more fair and balanced than any other TV news organization, but if they are going to continue down the path we saw at that debate, they will have a lot of their previous faithful viewers no longer following. I have talked to many people about the debate, and I have not talked to one yet that was not disappointed in Fox. They may have earned a bit more respect from their liberal media peers, but they lost it with a lot of their viewers. The first question of the night revealed that this was not going to be a debate as much as an inquisition. That’s not wrong if you call it that. Like leaders with courage, the country is starving for trustworthy media sources. However, it is not the place of the media to be the judge or the jury. When they try to be judges and jury, they lose. The liberal media has still not figured that out, and now Fox seems to be going the same way, but let’s pray they don’t. Some of this debate was like watching a football game where the officials started intercepting passes and outrageously interfering with the game to determine the winners and losers. The moderators appeared to think that their views were as important as the candidates. The questions that night were loaded with the opinions of the moderators to the degree that it was, at times, embarrassing. Worse, we tuned in to hear the candidates' positions, not theirs. If you had any doubt about the above, consider this: the candidates had an average total time of less than seven minutes each and the moderators had thirty-two minutes. Since the moderators seemed so intent on being the main attraction, it should not have been a surprise that the moderators became a main part of the story. That is a sure sign there has been a failure, like when the officiating becomes the main story about a game. That being said, it was a remarkable feat that many of the candidates were so sharp, insightful, focused, and brilliant. Many who have been ashamed to be part of the Republican Party lately were given hope, by both the early debate and the primetime. In spite of all of the glitches and flaws, it could have been one of the most interesting debates of all time. Normal politics has the Republican establishment trying to get rid of Trump because they cannot control him and he’s stealing so much of the attention. Normal politics and normal politicians are the ones killing us, and their day has passed. The Republican brand will likely suffer terminal indifference if Trump is knocked out of the field too soon. If they do not grasp the change, this really could be the end of the Republican Party as a major political party in America. Worse, if Americans do not seize the necessary change, America, as we know it, will cease to exist. The stakes could not be higher. The Republican Party promised that if the people would rally and vote them into the majority in the House, the chamber given the “power of the purse” by the Constitution, they would defund Obamacare as well as right many other wrongs. The people rallied and gave it to them, and they did nothing. The people were then told by the Republican Party that if they rallied and voted for them to be the majority in the Senate, they would certainly defund Obamacare and rein in some of the other madness being imposed on America, such as the unsecured borders. The people again rallied and did their part. The Republicans added control of the Senate to their control in the House, and did nothing. Since Watergate there may not have been more disappointment, frustration, and increasing disdain for the Republican leadership than now. With Nixon it was because of corruption and deception, but now it’s because of weakness and cowardice. This will be fatal to the Republican Party if not corrected. Donald Trump has done more than strike a nerve by addressing the appalling incompetence, or worse, on the part of our government to secure our borders. He has shown something that Republicans have not seen in the leadership for a long time—courage. The Republican establishment may be embarrassed by Trump, but they don’t seem to get just how embarrassed the rank and file is with them. When I was in Washington a few months ago, I was at a breakfast with a few senators and congressmen. One of them pulled me aside and said something that still causes me great grief. He said that if they would see more courage in the church, we would see more courage in Washington. I plead guilty. Church leadership is now as disrespected as our political leadership because, in general, we have become so afraid of offending someone. The Apostle Paul wrote in Galatians 1:10, “If I were still trying to please men, I would not be a bond-servant of Christ.” We forsake following the Lord to the degree that we are controlled by the fear of man. Maybe this is why at the end of the Book of Revelation the first group that gets thrown into the lake of fire is the cowardly. Our whole country is being neutered by fear of those who have no authority to be our judges. We have a vacuum of leadership because true leadership takes courage, and that is now one of the rarest qualities in virtually any place. Ted Cruz showed an uncommon courage when he stood in the Senate alone filibustering for the causes he and many others had run on. Where were all of the others who had run on those causes? Cruz stood alone to boldly challenge the Republican leadership when they caved on their promises, but why weren’t more standing there with him? Thank God for at least one who was willing to stand even if he had to stand alone. I also thank God for Trump and the courageous example he’s setting now. He still hasn’t won my vote, but he has won my respect. So what can we do about what is happening? Start living courageously. We must refuse to be controlled by what anyone else thinks, but rather by what the One thinks who called us. The whole world is now starved for courageous leadership. The people will follow courage and they have courage. It's the leadership that has been neutered. In such times of compromise and the blurring of clear distinctions, speaking the truth is a revolutionary act. It will shock people, and it will be controversial. Many people will not like you for it. The confused will almost always attack clarity. Many are more comfortable in the tyranny of the familiar fog because it does not require the courage it takes to face the truth. But these must not be allowed to dictate our course any longer. It is time for clarity and for courage. 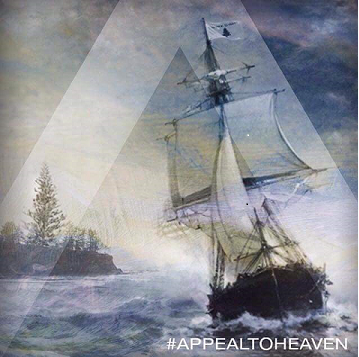 Note the flag at the top of the mast that reads, "Appeal to Heaven." This was our first national flag, and yet now prayer is banned in most public places. Become a Member, Start A Group, Make a Donation - All Are Important!